Chas is still overseas having fun and tasting beers. I’m still naively waiting on the Super Stout. So… what to do when not brewing? Help a mate with his brew! Last weekend here in Melbourne was a long weekend thanks to Queen’s Birthday public holiday. No, it’s not her Birthday, the holiday is about something else. Anyway. On Saturday I went around to my mate Michael‘s place. He’s been doing all grain for a while. Last time I was there I had to leave early and missed a few things. This time I was there from start to (nearly) the very end. This was a very long day. Started at 10:30 am and at 5:15 pm both the airing of the wort and pitching of the yeast were still left to do. That’s one very long brew day for a home brew. Like last time Michael was doing a Belgian quad, which didn’t work out that well. This time a Strong Belgian Golden Ale, which hopefully turns out well. The process was mainly the same. Fist heat the water for the mash and then put that in the mash tun. Grain goes in, stir and wait. Recirculate the liquid to settle the grain bed. Next was a bit different. 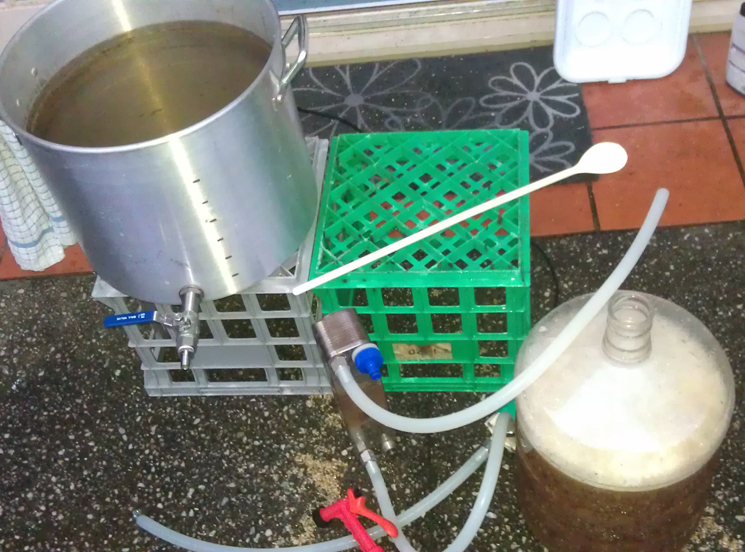 Fly sparge rather than batch sparge. What you do is slowly drip water over the top while letting the liquid drain out the bottom. Apparently, if done right you get a better conversion (getting sugars from the grains) than batch sparing. Boil was next. A long boil as Michael needed to reduce volume. After that was done a hop bag with loose leaf hop flowers went in. 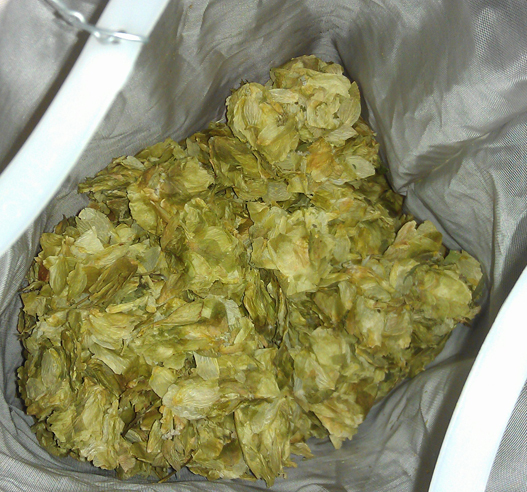 I’ve never seen loose leaf hops before. Most people I know use pellets. Had a taste and wasn’t sure what to think about them. Interesting, but not sure if it’s for me. The chilling was very cool (pun fully intended). Michael has a counter flow plate chiller. Brew goes in one end and out the other, while cold tap water goes in the reverse direction in a different channel. 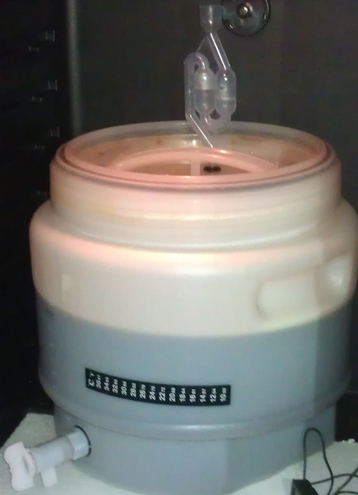 Long story short, lots of liquid moves really quickly and your brew gets chilled a lot. 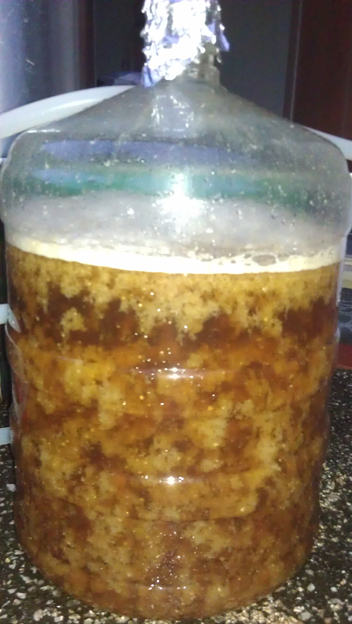 Like I said, had to leave before the brew was aerated or the yeast pitched. But, you can get an idea from the photos how much goes on. Lots of steps and lots of equipment. I have to say, I’m slightly jealous of all the equipment. But that’s offset by the idea of having to (a) take so long to make a beer and (b) that thought of cleaning all that equipment. Then Monday went around to my good mate Ian‘s place. He wanted to do An American Brown Ale. Something nice to have over the cooler months. And, to be completely different to the all grain brew, it was an all extract brew. For this brew I was there from the very start to the very end. Plus it was a lot quicker. Dry malt extract and hop pellets measured out. Boil the water, first addition of dry malt, hot break, add hops 1, add hops 2, add hops 3 and the last of the dry malt. Then onto chilling, which went a lot quicker than expected. We chilled it so well that it was almost too cool to pitch the yeats. But before the yeast went in I made Ian take a gravity reading. Hopefully this means we’ll known the alcohol percentage on his beer. Thinking back on the long weekend, I’m not sure which brew day I enjoyed more. They were both laid back in their own way. Ian’s was pretty easy, but a fair few things on one after the other. And once it was all done we hung out for a while which was fun. The brew day at Michael’s was a lot longer. And as a lot of steps took a chunk of time there was plenty of down time. That said it was also a lot more complex and a few things were nearly missed. One thing I know for sure, brew days are fun.